BR Backup is used to take backup of the database (Datafiles). When ever a backup is triggered BR Backup is initialized. The database is down during backup and no transaction is allowed as it is down. It is consistent and reliable. Whole Offline Backup: The backup taken fully and a catalog is opened to start the incremental backup. Eg: A database is of 2000 GB Which is not possible to take a daily full offline backup with a backup speed of 150GB/ Hour. Full Offline Backup: It is a complete database backup without any Catalog. The DB is up and running with out effecting the user transactions. It is consistent and reliable with redo logs that are generating during backup. Whole Online Backup: The backup is taken fully and a catalog is opened to start the online incremental backup. Full Online Backup: It is complete database backup with out any catalogs. 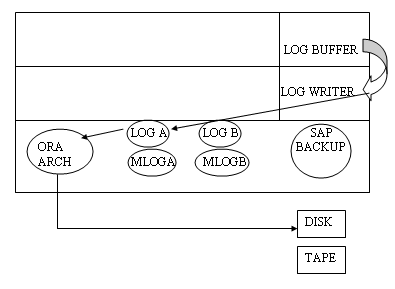 Online Backup: It is consistent always with redo logs. It is initiated from level0 backup and used when the database size is too big. It can be online or offline. All the above backups are performed by using brbackup. It is used to backup the offline redolog file to tape or disk i.e. from ORAARCH directory to tape or disk. Reads content from Log Buffer. Log writer writes to OrigLogA and OrigLog B, Mirror Log A, Mirror Log B. When OrigLog A is full it is moved to OrigLog B When OraArch is full it is backed up to a tape or disk. - Archive function means the saving mechanism of log files. (Offline redologs) the content of oraarch is referred as offline redo logs. - If Oraarch is full the archive gets stuck and the complete update mechanism stuck and users encounter congestion. - So the Oraarch content needs to be moved to alternative location on hourly, bi-hourly for every 4 hours or daily depending upon the frequency of updates. - While copying Oracle provides various means of log save because we don't want the corruption of logs. The data transfer from Oraarch to disk is done by BRArchive. It uses BRConnect, BRBackup, BRRestore, BRRecover with various options. We can do the following with BRTools. - Extend the tablespace by adding datafile or resizing datafile. Max datafiles are 250 in SAP. - Display profiles, change schema password etc.